The GIScience Center is responsible for teaching and research in geographic information science within the Department of Geography. Three of the thirteen groups of our department make up the GIScience Center: Geographic Information Visualization & Analysis (GIVA), Geocomputation (Geocomp) and Geographic Information Systems (GIS). GIVA is glad to welcome Armand, Oliver, and Tumasch, the three new members of the team! Tumasch Reichenbacher is a senior scientist and a specialist in analyzing and visualizing geographic information. Tumasch gives the lecture in cartography (GEO123) this spring. Oliver Grübner is a senior researcher in Epidemiology and Biostatistics. In his research, he uses spatial epidemiological approaches to chronic diseases including mental health and he tries to understand how social media can be leveraged in this context. At GIVA, Oliver teaches the Geovisualization (GEO878) and Statistics (GEO246) courses this spring. Armand Kapaj is the new PhD student in the context of the ERC Advanced Project GeoViSense. We’re thrilled to have you on board ! Humans inscreasingly navigate using smart mapping apps. While this geographic information technology is convenient, it is limited in supporting us in our cognitive abilities to orient ourselves in space, and to acquire knowledge about our surroundings. 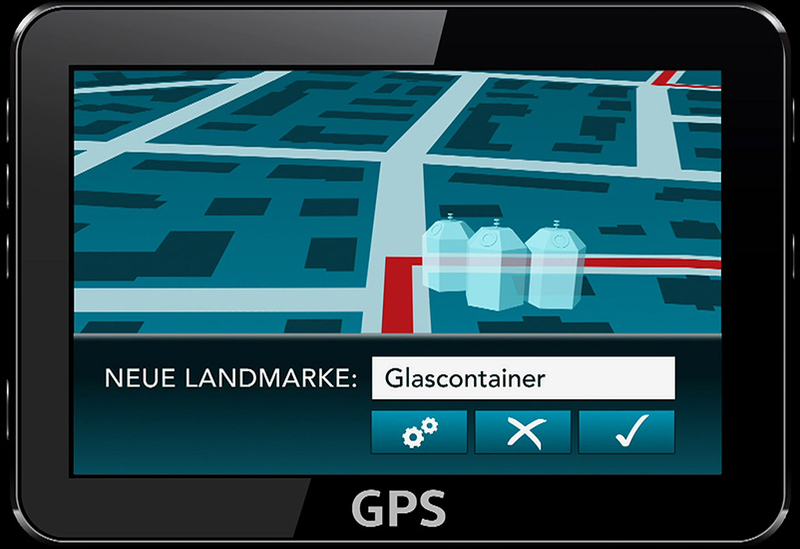 In the SNF supported Emotive project, Sara Irina Fabrikant, Kai-Florian Richter, Annina Brügger and Sascha Credé investigate how smart navigation assistants of the future should be designed to not only take navigators and wayfinders safely to their desired destinations, but also to support them in learning to orient and wayfind themselves. 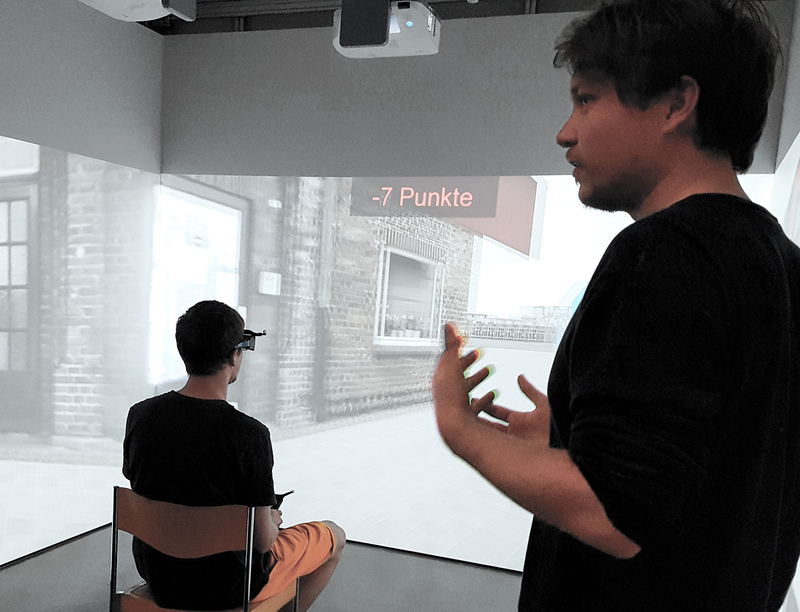 This Emotive research has been featured in a televised report, developed by the SRF Nano team. You can see the broadcasted video here. We wish take the opportunity to thank the SRF Nano team for this expressive results of a pleasant and professional collaboration. 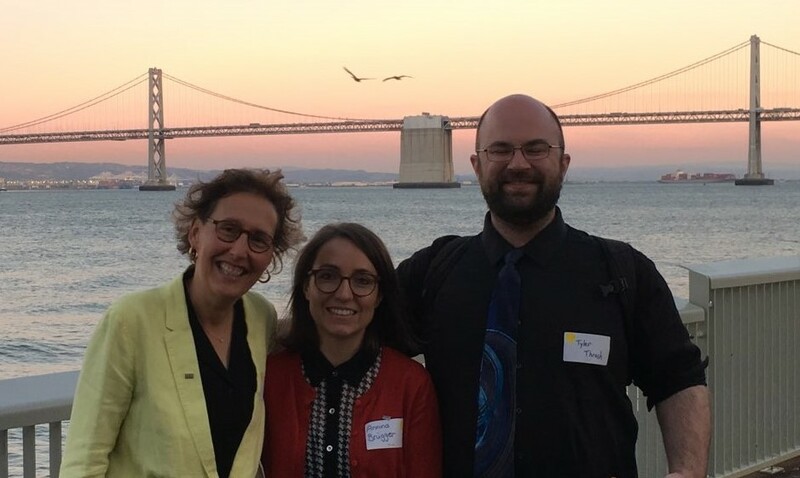 Sara Irina Fabrikant, Tyler Thrash and Annina Brügger organized a workshop on Wayfinding and Navigation as part of the Urban Tech Summit at the event "Zürich meets San Francisco" in corporation with swissnex SF on Oct, 23, 2018 in San Francisco (US). In Santa Barbara, they hosted a workshop on geographic information displays (GIDs) at the Center for Spatial Studies at UCSB and visited the companies Biopac and WorldViz to get informed on the latest developments on physiology experiments and virtual reality. 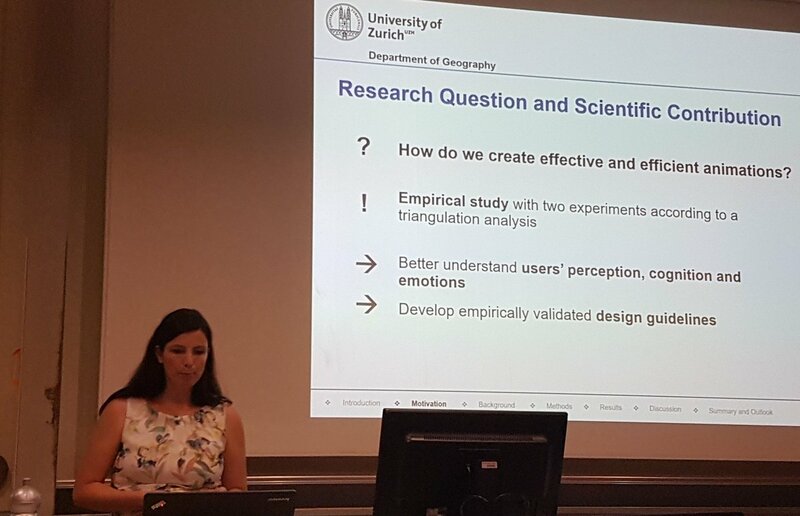 As part of the new ERC Advanced Grant "GeoViSense", Sara Fabrikant and team organized a two-day workshop in Zurich on the topic of personalized and context-responsive geographic information displays (GIDs). We invited participants from around Europe in order to discuss the future of GIDs and devise designs for GIDs during a series of small group exercises. The participants included experts from various disciplines, including computer science, cognitive science, geography, and neuroscience. GIVA says thank you for your most valuable input! Sara Fabrikant held her keynote at the 21st AGILE conference in Lund, Sweden on 12-15 June, 2018. 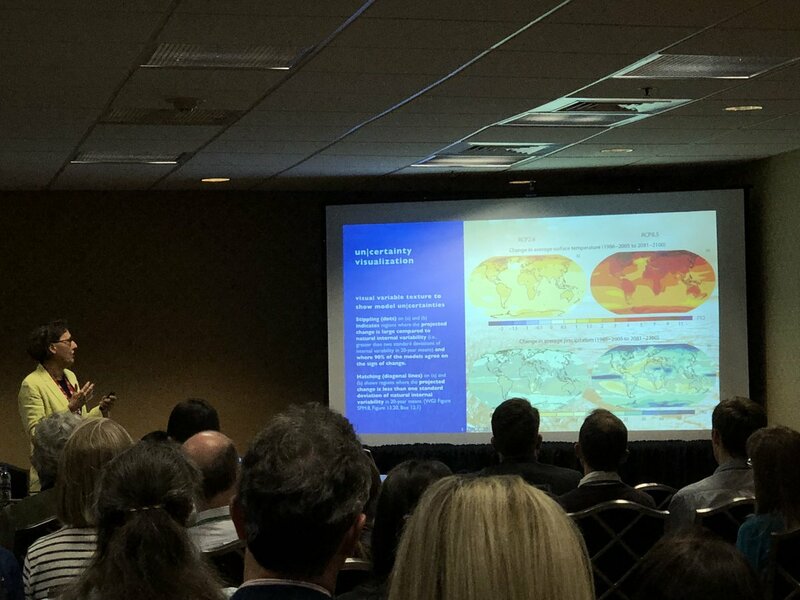 In her talk "Geotechnologies for All: Leaving All for Last" Sara highlighted ongoing empirical research on human and context responsive geographic information displays. Her talk stimulated interessting discussions on designing human, task, and context responsive geographic information interfaces for all. Relying on digital navigation assistance is often the most comfortable way of finding one's way through unfamiliar places. However, we typically don't pay a lot of attention to the path we are following and when assistance is not available anymore, we find ourselves disoriented. What are the reasons for this negative relation and how can we improve navigation displays so that they support orientation in the long term? 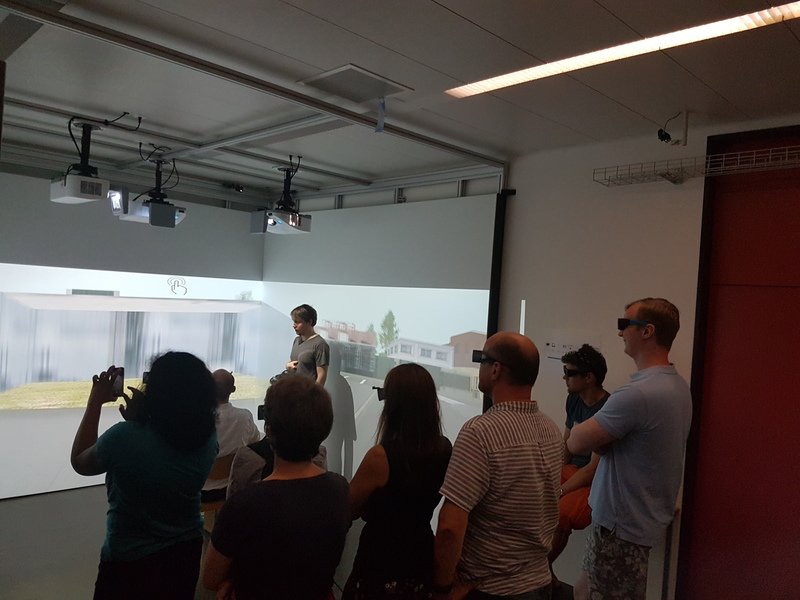 At the Tag der Informatik, GIVA demonstrated their virtual reality laboratories to a public audience. Sascha Credé, Marie Müller and Arzu Cöltekin illustrated how empirical user studies in virtual cities can help to answer these questions. We like to say thank you for your interest and for the good discussions! 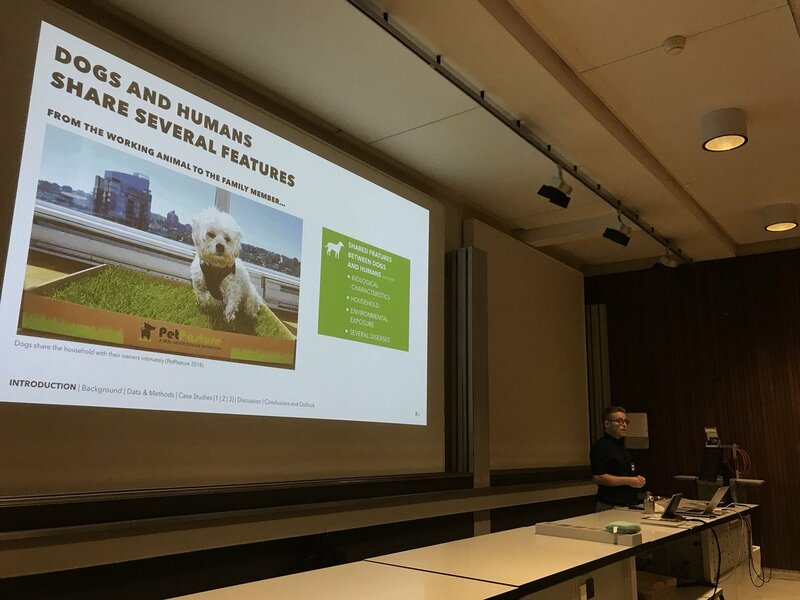 With great pleasure we announce that Gianluca Boo has successfully defended his PhD thesis on “Dogs as Sentinels for Environmental Cancers Addressing the Challenges of Spatial Epidemiology”. Congratulations from the GIVA group. We wish Gianluca all the best for his future plans! Strong showing of GIVA members at the Spatial Cognition 2018 in Tübingen, Germany. All submissions (three posters and two workshops) were accepted and will be presented in Tübingen, Germany, September 5-8, 2018. We are looking forward to have interesting discussions. During her research stay at the Computing Science Department at Umeå University, Annina Brügger extended her knowledge of Computing Science, human-computer interaction (HCI) and artificial intelligence (AI). 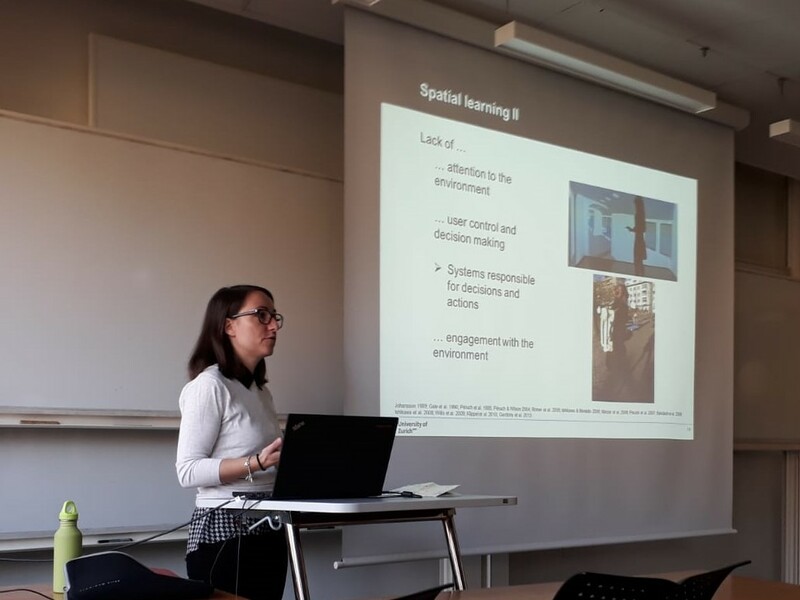 Her talk titled "Automation in navigation systems - a focus on spatial learning" gave the audience an insight into automated systems and cognition from a spatial, geographical perspective. The talk and the research stay stimulated interesting and interdisciplinary discussions. Are you interested in carrying out a PhD? We are happy to invite applications for a doctoral research position in the context of the ERC Advanced Project GeoViSense, led by the GIVA group head and PI Sara Irina Fabrikant. 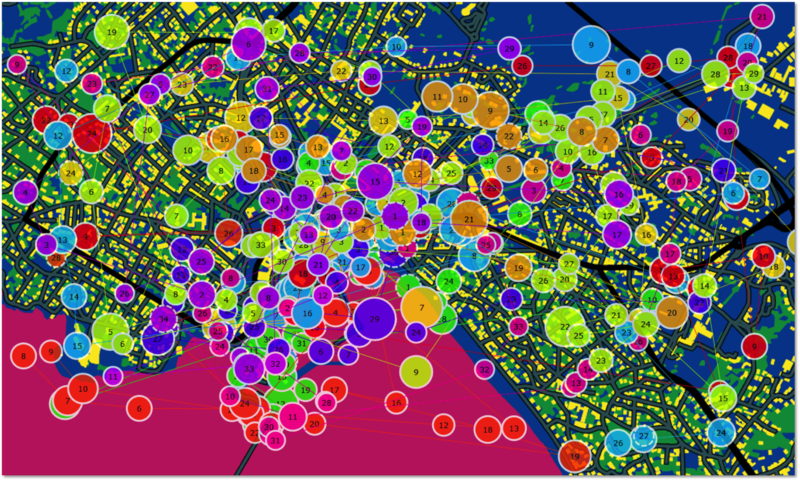 This project, at the interface of GIScience (geovisual analytics) and neuro-cognitive science aims to study how we make space-time decisions with geographic information displays (GIDs) in varying mobile decision making contexts. 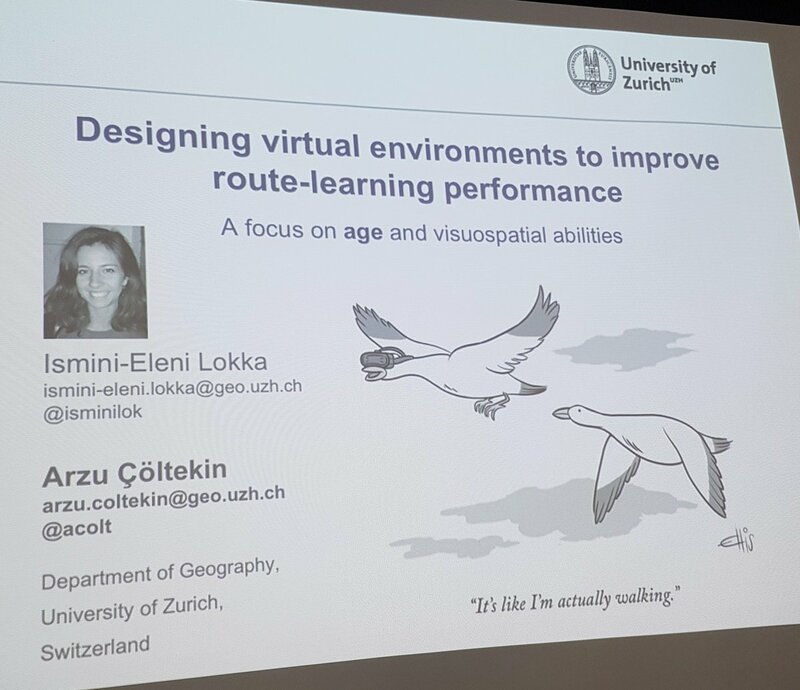 Annina Brügger, Ismini Lokka, Kenan Bektas and Arzu Cöltekin attended the 3rd International Workshop on Eye Tracking for Spatial Research (ET4S 2018) in Zurich (Switzerland) on January 14, 2018. They presented their work on eye tracking in oral talks and demo sessions. 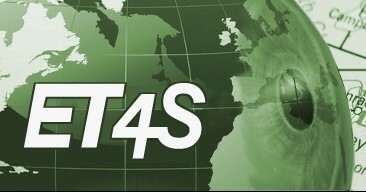 The ET4S workshop brought together researchers from different areas who have a common interest in using eye tracking for research questions related to spatial information. Dekan Roland Sigel, GIVA's newest graduate Sara Maggi and Sara Irina Fabrikant at graduation ceremony. GIVA wishes Sara Maggi all the best and every success for the future. Congratulation for defending his PhD thesis! 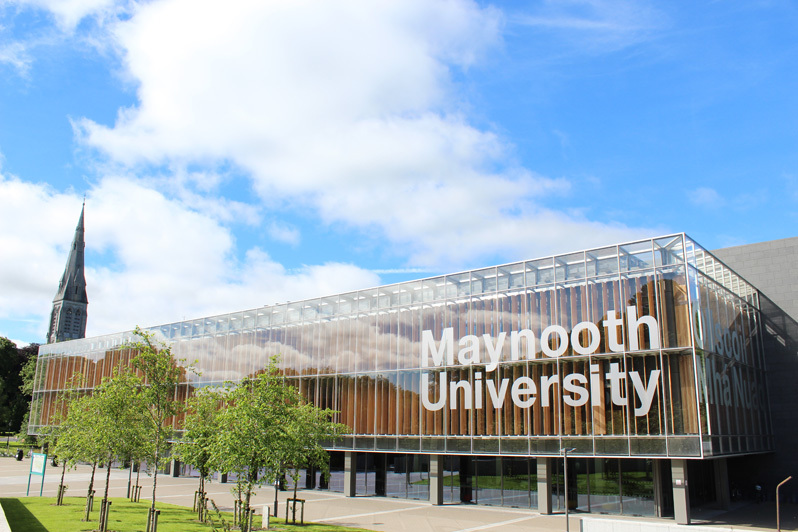 The Michael Breheny Prize is awarded annually for the most innovative paper in Environment and Planning B: Urban Analytics and City Science. The paper is chosen by the editors assisted occasionally by members of he editorial board of the journal. This year all four editors, Michael Batt, Richard Harris, Linda See and Sarah Williams with Dr. Seraphim Alvenides of Northumbria University made the choice, agreeing that the best paper published in 2016 be awarded to Marco. M. Salvini and Sara I. Fabrikant for their paper "Spatialization of user-generated content to uncover the multirelational world city network". Congrats for this international recognition of former GIVA member Dr. Marco Salvini. 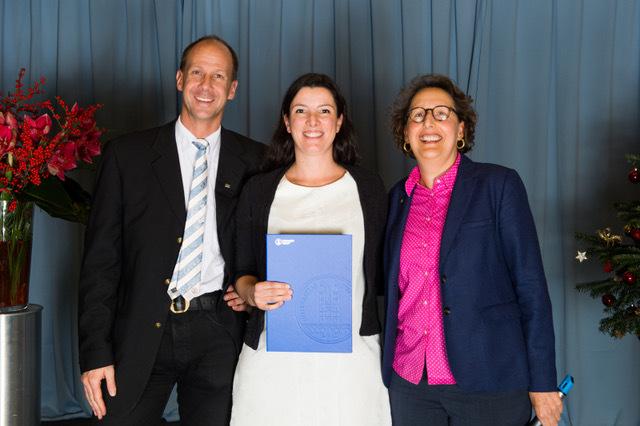 Marco already received an UZH Science Distinction in 2012 for his PhD research. 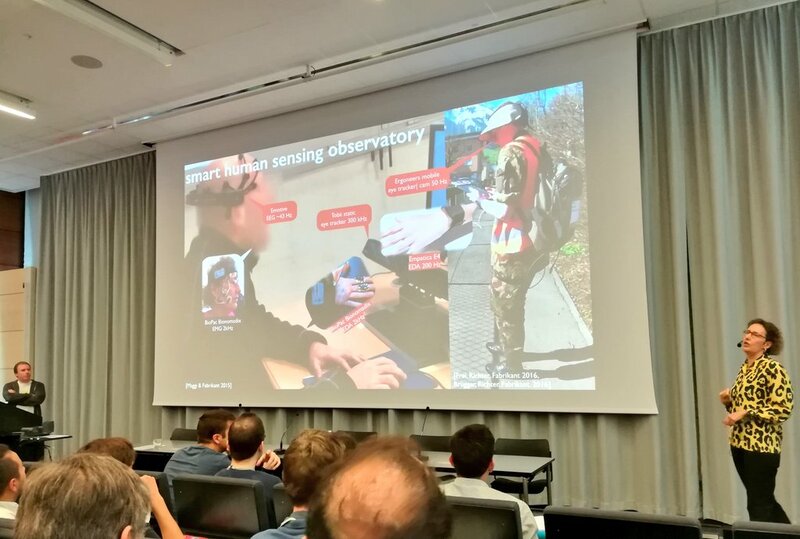 Strong showing of GIVA members at the 3rd International Workshop on Eye Tracking for Spatial Research as part of the LBS 2018 conference: two short-papers and one Demo case were accepted for oral presentation in Zürich, January 14-17, 2018. Sascha Credé, Annina Brügger, Sara Irina Fabrikant and Kai-Florian Richter (former GIVA member) attended the 13th International Conference on Spatial Information Theory (COSIT) in l'Aquila (Italy) from 4th to 8th of September 2017. Besides presenting at the doctoral colloquium (Annina Brügger) and at the workshop Rethinking Wayfinding Support Systems (Sascha Credé), they both won a Best Poster Award (first and third place). Congratulations! GIVA invites motivated researchers for applications for two doctoral and two post-doctoral research positions in the context of the ERC Advanced Project GeoViSense, lead by the GIVA group head and PI Sara Irina Fabrikant. an online questionnaire which addresses geographers and laypersons. Feel free to participate (20 minutes). You’d make a Master’s student’s day! Halldór Janetzko and colleagues presented their recent work on soccer movement generalization at the 19th EG/VGTC Conference on Visualization in Barcelona from 12th to 16th June. They won the Honorable Mention Award for their full paper on „Dynamic Visual Abstraction of Soccer Movement“. 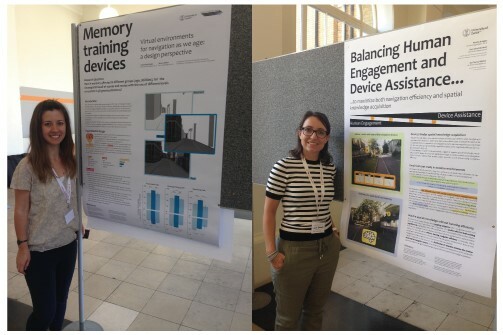 Ismini E. Lokka and Annina Brügger presented their posters at the Urban Wayfinding and the Brain conference organized by the Royal Institute of Navigation, University College London and The Knowledge Transfer Network in London on June 14, 2017. Along with the other units in GIScience Center, we hosted an excursion for 19 Geomatics students from the Institute of Geomatics Engineering FHNW on 16th of May 2017. After an overview of the research activities in respective groups, we demonstrated our CAVE where students explored the lab as a visualization research environment. 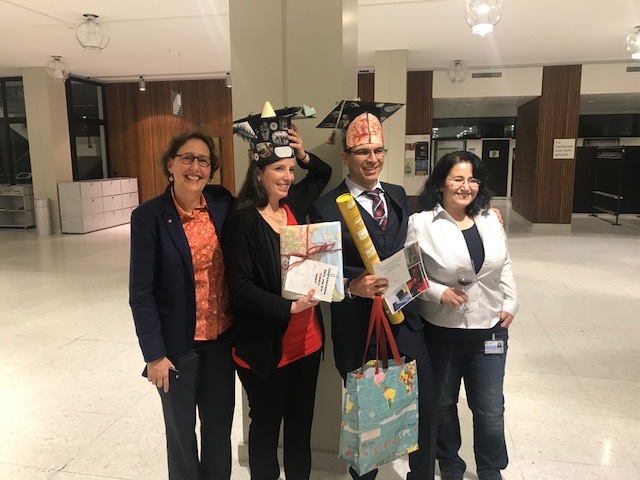 With great pleasure we announce that Sara Maggi has successfully defended her PhD thesis on “Depicting Movement Data with Animations for Embodied and Real-Time Decision-Making: A User Study with Air Traffic Control Displays and Real-Time Movement Data”. Congratulations from the GIVA group! Gianluca Boo was invited for an academic visit at the National Centre for Geocomputation (NCG) University of Maynooth, Ireland. Together with Prof. Chris Brunsdon, the director of the centre, Gianluca worked on a manuscript titled “A robust investigation of spatial-non stationarity and scale effects in models of canine cancer incidence”. Strong showing of GIVA members at the 28th International Cartographic Conference 2017: All 6 submissions (extended abstracts) were accepted for oral presentation at the main conference in Washington, July 2-7, 2017. André Bruggmann was invited to give a ThinkSpatial brownbag talk at the Center for Spatial Studies of the University of California, Santa Barbara (UCSB). In his talk titled „How Does GIScience Support Spatio-Temporal and Thematic Information Exploration in the Humanities“ he presented latest findings of his PhD project on how spatio-temporal and thematic information and interconnections implicitly stored in large online text archives in the humanities can be made explicit, and how this might help information seekers in the humanities learn and gain new insight into space, time, and theme. Find a detailed description of his talk here. Sara Irina Fabrikant, Gianluca Boo and Annina Brügger each presented their current work at the GIScience 2016 conference in Montreal, Canada, from September 27 to 30. Gianluca Boo won the award for the best poster presentation and Annina Brügger won the award for the best short paper.